Welcome to our first Instagram growth and engagement study of the year 2016. 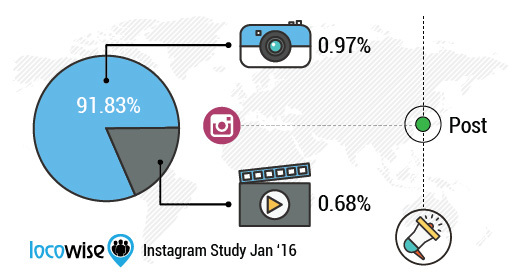 We’ll look at the performance of 2,500 Instagram profiles in the month of January. There are several interesting updates to go through this month. Let’s get started with the look at the follower growth. 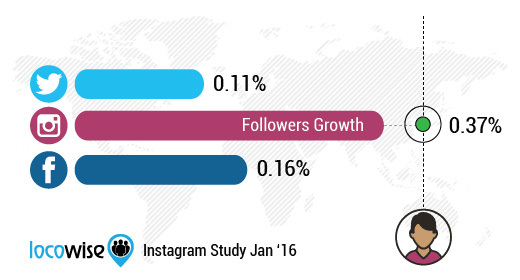 Instagram follower growth in January was 0.37%. This is a 60.87% increase compared to December and the highest growth since August 2015. This is positive news for brands trying to grow organically as December had the lowest growth since we started doing our studies. Instagram is still the “king” of follower growth when compared to Facebook and Twitter. Facebook’s organic page likes growth in January was 0.16% while Twitter’s follower growth was 0.11%. Having “audience size” as one of your KPI’s is not the most appropriate way of measuring performance. It’s very difficult to grow much without spending money on advertising, no matter how great your organic content efforts are. It’s worth considering this when setting your goals and targets for the year. Engagement rate may be a metric that helps you measure the results of your efforts better. 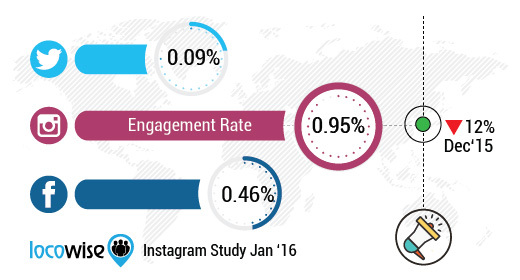 Let’s take a look at Instagram engagement in January. Post engagement rate in January was at 0.95% of the total audience. This is a 12.04% decrease compared to December and the lowest engagement rate since we started doing our studies ten months ago. Instagram engagement has dropped by 66.07% in this time period. During the same period Instagram has ramped up its advertising business as Facebook is pushing the platform to deliver return-on-investment. Some reports show that the volume of Instagram ad impressions has increased by a factor of 13 over the last 5 months. The plan is to get even more advertisers on board. 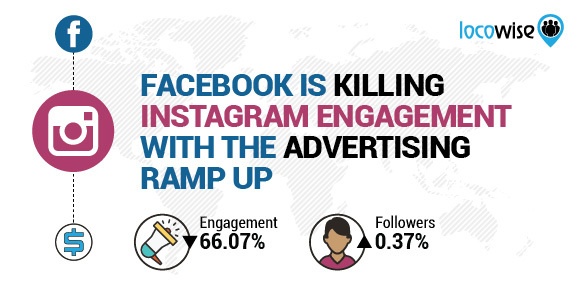 Instagram ER still beats Twitter (0.09%) and Facebook (0.46%), but it could be in danger of killing the engagement with such a large volume of ads. Analysts predict that Instagram will grow to 520 million monthly active users during the year and that it will generate up to $2 billion in revenue by end of 2016. Instagram does no longer seem as independent as it was in the years since the acquisition in 2012. It’s interesting to think about how long WhatsApp will be able to hold the commitment to not run advertising. Instagram introduced 60-seconds video ads as a preparation for the Super Bowl. This is convenient for brands as it allows them to reuse the ads from other platforms rather than needing to create something Instagram specific. Facebook’s COO Sheryl Sandberg announced that Facebook is happy with the advertising growth on Instagram. She didn’t disclose any specific revenue numbers but 98 of the top 100 Facebook advertisers now also advertise on Instagram. Instagram is seen as one of the main reasons why Facebook’s ad impressions in 4th quarter of 2015 increased by 29% year-on-year. Twitter’s response to low engagement is the experimentation with an algorithmic timeline. Will Instagram be doing the same over the upcoming months? Time will tell. Instagram wants you to watch more video on the platform. It also wants more creators to post more video. The time users spend watching videos increased by more than 40% over the last 6 months, but images are still the most popular format by far. 91.83% of all posts during the month of January were images. An image post engaged 0.97% of the total audience while a video post engaged 0.68%. One attempt Instagram is doing to boost video is to show view counts. 3 seconds counts as a view on Instagram just like on Facebook. Another attempt is to curate best videos from live events such as sports matches and award ceremonies. Many more updates to the video experience are expected over the upcoming months in hope of attracting more quality video from some of the top video publishers. One new feature that social media marketers will appreciate is the ability to switch between multiple accounts on the Instagram app. You can now add up to 5 accounts on both the iOS and Android apps. That will make you more efficient and productive. Two-factor authentication is available now as well. This will help you keep your account more safe and secure. Start publishing on Instagram. The platform still has the strongest opportunities for organic growth and engagement. Compare your performance against other profiles using our Instagram Analyser. This will help you understand how your growth and engagement is compared to the rest of profiles in our study. Experiment with video to see how it performs for you. Instagram is pushing video more and it might just be the next big video platform.